Cristi, Nora and Liu say goodbye from Kit’s Couture – but for how long? Back in the summer I developed a rotator cuff injury in one shoulder, and while it has improved a good deal, it’s still there and mouse work at the computer aggravates the problem. Swapping my mouse to the other hand has not helped, because now the other shoulder has a similar problem – and that’s in spite of swapping over to using an ergonomic split keyboard and a vertical mouse. The cure is to rest the muscles as much as possible, and this is why the blog has been inactive for the last six months. As my work depends on my being able to use a PC, I have got to take this problem very seriously. And as, unfortunately, the RSI is persistent and is obviously going to take a good long while to clear up, I feel I have to close down this blog for the foreseeable future. I’ve no idea how long that will be, perhaps just a matter of months, perhaps longer. We will definitely be back at some stage. But for now, it’s goodbye from team Kit’s Couture. Rhiannon and Sophie are pleased to show you the first two outfits in the Kit’s Couture Spring collection, featuring two different styles of peplum top and some easy-to-wear Malibu pants for Rhiannon. The outfits feature the colours of Spring, and so are modelled by two of my Spring girls. They are made to fit the two most popular sizes of 18″ standing doll: the ‘sturdy’ American Girl, and the slim Kidz ‘n’ Cats. Floral print with moss-green lace and soft pink buttons. Click to enlarge. Sophie’s sleeveless and lined peplum top, which fastens at the back, is made with a pattern by Barbara Russell sized for Kidz ‘n’ Cats. I was very impressed with the fit of this top, and with the very clear instructions for making up the garment. The only change I made was to cut the peplum half an inch longer so that I could enclose the raw edge in a double-fold hem. I chose a floral print in Spring colours, and embellished it with lace in an assertive moss-green which matches the stems of the flowers perfectly and stands out well from the busy print. Between the two strips of lace I added three pale pink buttons which complete the decoration on the front. The buttons are echoed at the back where two more pink buttons help to disguise the velcro fastening. The top dresses up the Kit’s Couture jeans beautifully. I toyed with the idea of making Sophie some more dressy trousers, but she’s an outdoorsy kind of girl and loves her jeans. We both felt that the peplum top dressed them up just enough to be smart but comfortable. She has finished off her outfit with Monique Baby Heart Cut shoes size 75/34 in light blue. Peacock-blue print and Malibu pants. Rhiannon wears a striking outfit where the peacock-blue of the Malibu pants is picked up by the wonderful Liberty peacock print of her peplum top. 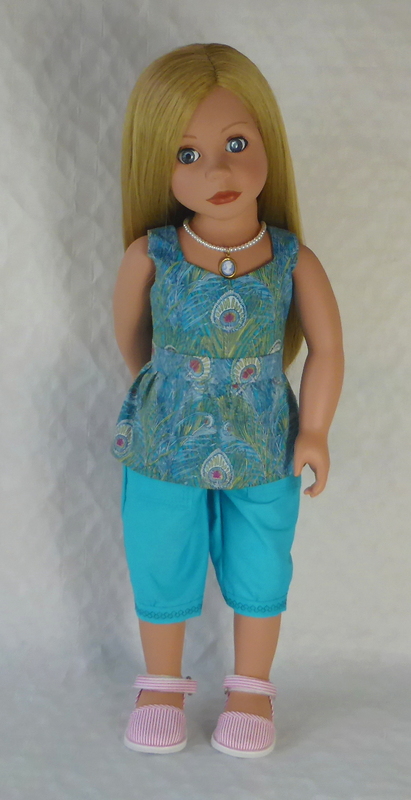 The outfit is made using two separate patterns available from Pixie Faire: the Malibu Beach Cropped Pants from 123 Mulberry Street, and the Liberty Jane Peplum Top. Both patterns are sized for American Girl and fit my modified (I reduced the size of her waist) Bonnie & Pearl girl well. 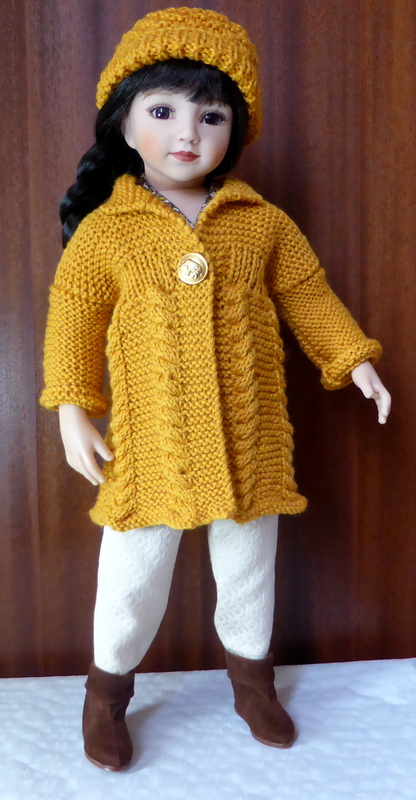 If making for a standard Bonnie & Pearl doll, check and adjust the waist measurements for both trousers and top as needed, as they tend to be thicker in the waist than American Girl. Neatly tailored Malibu Pants with machine-embroidered cuffs. 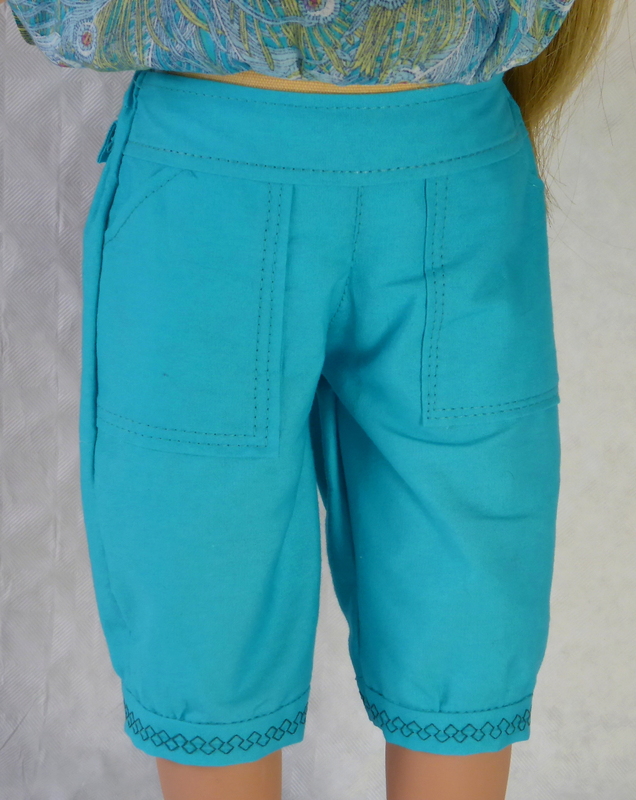 The Malibu pants pattern was excellent with very clear instructions, and I made it up with no problems at all. I deliberately chose a plain-coloured poly-cotton for these trousers, as the material for the top was so busy and assertive that anything but a plain fabric would fight with it. However, these trousers are not boring: they come with some nice design features like the big double-topstitched pockets and little double-topstitched mock-pocket flaps at the back. The only decoration I added was a line of machine-embroidered cross-stitch around each cuff. I made these trousers back in June 2014, nearly a year ago. Why take so long to bring them to the blog? Because my first attempt at a blouse was – frankly – not great. I had the most gorgeous ‘Hera’ Tana lawn, and had made it up into a blouse gathered at the neck, waist and cuffs – an enlarged and modified version of Annika’s gathered blouse. But I was never happy with it. Rhiannon looked stiff and uncomfortable in the gathered style, and I couldn’t get any photos I felt happy with. So finally I decided to re-cut the original blouse into a more fitted style. Its second incarnation – much better than the first! With the material salvaged from the gathered blouse, plus a small amount I had left over, I managed to find enough to cut out the body and waistband of the peplum top, and still place the ‘eyes’ of the peacock-feathers in a balanced way. I used the remains of the Malibu pants fabric for the lining. 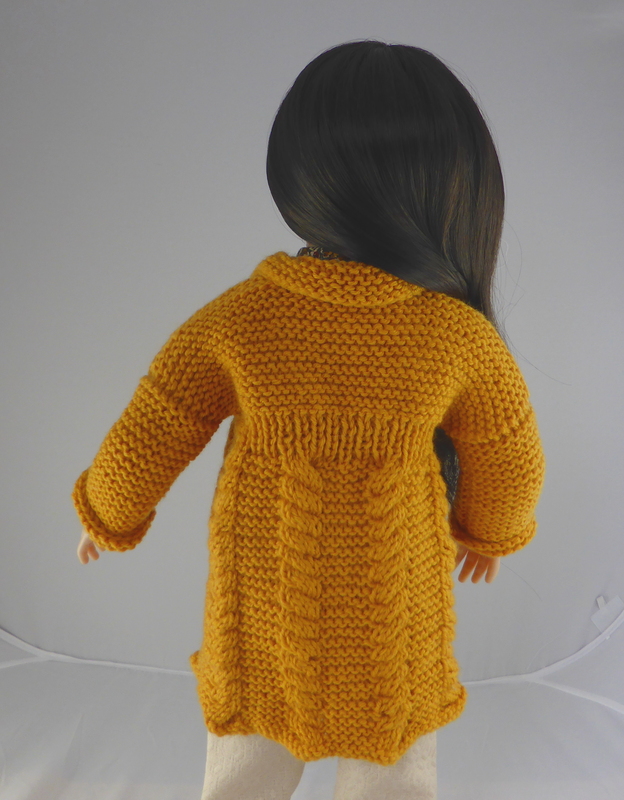 The top seemed as if it would be a bit long in the body for Rhiannon so I took a quarter-inch off the lower edge of the waistband. For the peplum itself I had to join separate pieces in order to make a long enough strip of fabric. To do this, I sewed my first-ever French seams! They sit nicely on the hip at each side, aligned with the underarm seams, and almost look as if they were meant to be there. The pattern calls for a zip to fasten it at the back, which would be my preference too, but at the time I had no suitable zip so decided to use the dreaded velcro once again. This pattern called for very exact sewing around the neckline, and I was delighted to see that I had got the sweetheart neckline perfectly balanced and even. I was very happy with the way the top turned out, and very pleased indeed to see how well it suited Rhiannon. She has teamed her outfit with a sweet pearl-and-cameo necklace, which sets off the sweetheart neckline very nicely. On her feet she wears some stripey summer sandals, just right for the warmer weather that we feel sure is just around the corner. Today I’ve been updating and restructuring the blog, and there are two new pages of information which will continue to grow and change over time. Meet Kit and Friends – this is a catalogue of all the dolls I’ve collected, listed under their different manufacturers. As new models join the team, they’ll be added here.It’s also an index page for all the ‘meet’ pages which have been steadily cluttering up the menu bar at the top of the blog. They are now linked off this page, or off the menu that opens up when you hover over the Meet Kit and Friends link in the menu bar. It’s good to declutter! Kit’s Colour Analysis – my first attempt at explaining seasonal colour analysis for dolls. I’m sure this section will change and grow: for a start, I will be adding photographs to help illustrate the concepts. It’s all good fun to play with dolls in this way – but we do take our colours seriously here at Kit’s Couture. Three for Spring – dress, hat and cardy. Click to enlarge. There are some lovely sewing and knitting patterns coming out of France for the Kidz ‘n’ Cats. The knitting designs by (Monique) Soudane are particularly charming and stylish. I have had three of her patterns for two years now, but have only completed one of them, Trois Printemps. This pattern first brought the Kidz ‘n’ Cats dolls to my attention. Soudane is a fine photographer and her shots of her 2009 Helen wearing this charming little outfit just blew me away. 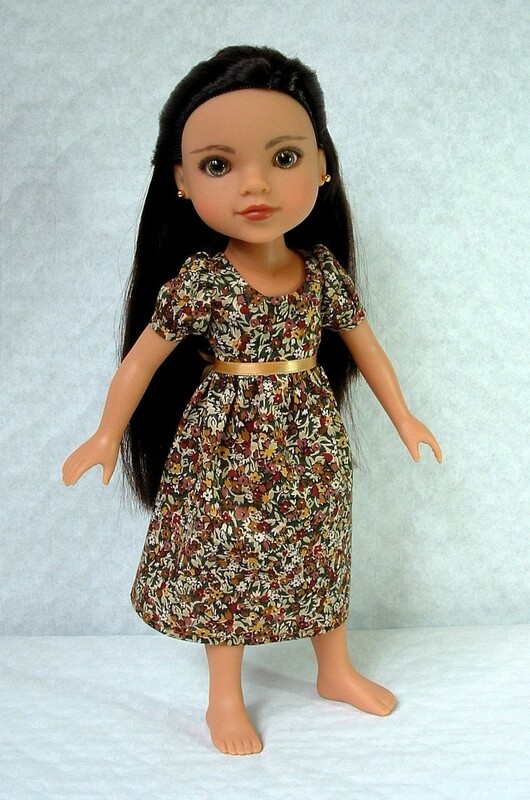 I had to have this doll – oh, and the pattern too, of course. Getting the pattern was easy, but to my disappointment by the spring of 2013 Helen was no longer in production. I ordered Sophie instead, sent off to France for the right yarn, and once it arrived got busily knitting. The outfit has been complete for two years now, but it looked disappointing on Sophie and I have only just found the perfect model to show it to you – Helen, of course! Last year I was lucky enough to find my own Helen – not the truly exquisite 2009/10 version, but the 2011 model is nevertheless a very fine doll indeed. And she’s extremely photogenic! I loved the original colours, lilac and white, so much that I ordered the exact same shades of yarn, and my own interpretation of the pattern does closely resemble the photos in the pattern which you can see on Soudane’s Etsy page. The yarn needed is “Ambre” from Cheval Blanc, in shades 011-Blanc and 044-Lilas. Casting my mind back two years, I don’t recall any problems with the pattern at all. My only criticism would be that it turned out rather large for the slim Kidz ‘n’ Cats. However Soudane does describe it as being suitable for both Kidz ‘n’ Cats, and for dolls of the size of American Girl, which are much more bulky. Certainly this set does fit my American Girl, Kit, perfectly. On Helen it’s a little roomy, particularly the hat. All that being said, she wears it well, particularly when she removes the cardigan and shows off the lovely detailing of the dress’s bodice and skirt, worn as a pinafore over a white long-sleeved Gotz t-shirt. With the outfit Helen wears her mauve Monique ‘Ribbon side Mary Janes‘ in size 75/34. You can almost see her breathing… Click to enlarge. 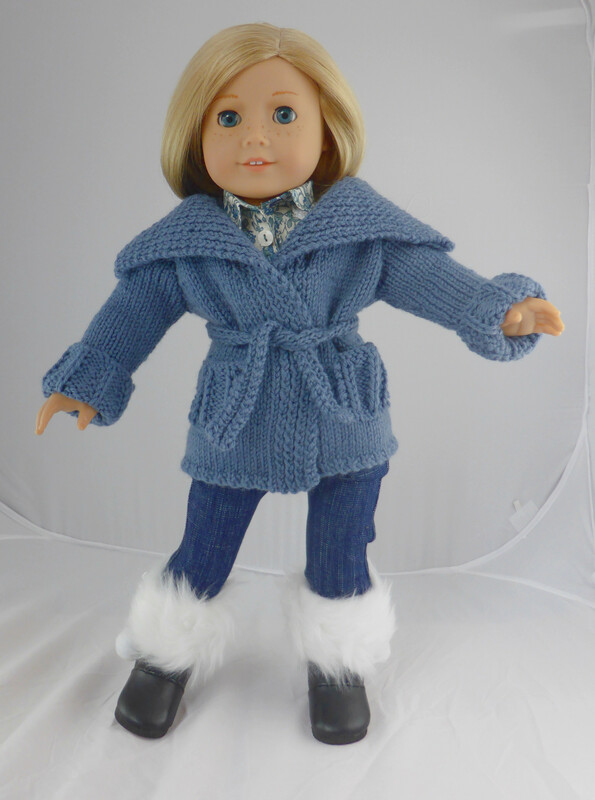 This outfit looks so good on Helen because the colours enhance her delicate, cool Winter colouring. Kidz ‘n’ Cats Sophie, also a blue-eyed blonde, is by contrast a Spring, and this cool mauve never looked quite right on her. Sophie needs clear, bright, warm colours. It’s a good example of how the temperature, shade and tone of a colour can make or break an otherwise lovely outfit. On Sophie, this ensemble looked all wrong, and I could never get a decent photograph of it. On Helen, it’s simply stunning. New model Saila Qilavvaq, my Maplelea Girl, steps out for the first time in a very unusual – to British eyes – parka for the colder months. 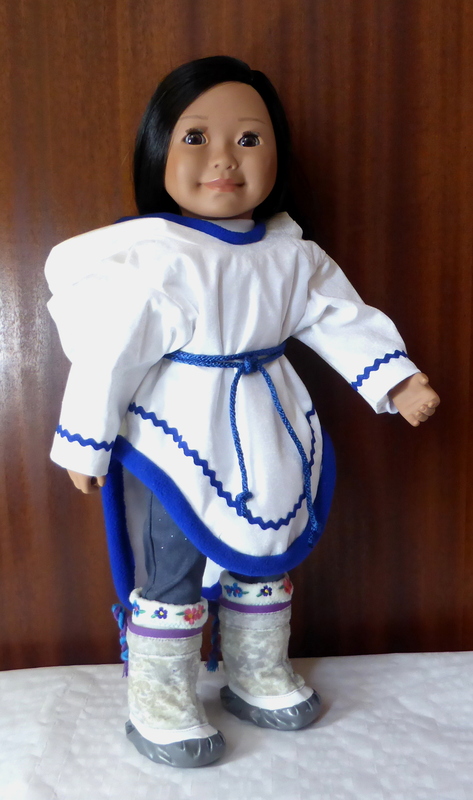 This very distinctive garment is an Amauti, an ethnic garment worn by Inuit women in Canada. Saila is finding it more difficult to settle in here in the UK than the other Kit’s Couture girls, because of course life is very different here from her home in Iqaluit, Nunavut Territory. So to help her feel at home, I made her an Amauti suitable for our mild winters. Traditionally the Amauti is made from animal skins – typically caribou – and of course its hood would often be lined with fur for warmth. 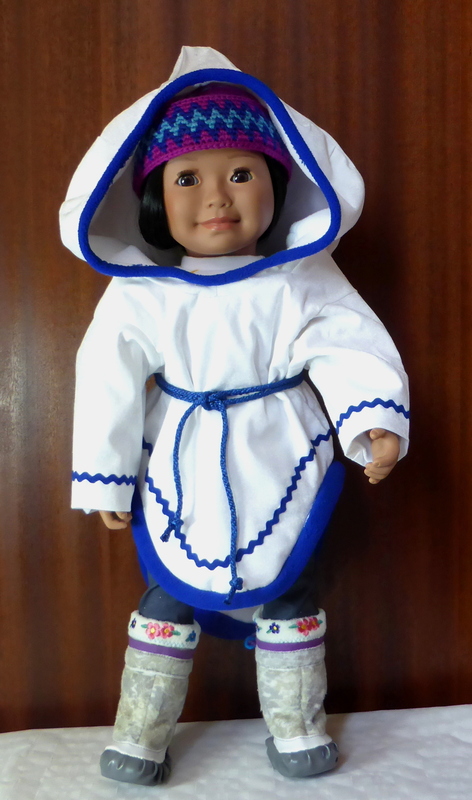 This is very important because the hood of the Amauti, along with the loose pouch-like back of the garment, is where Inuit women traditionally carry their babies. It needs to be warm, secure, water- and wind-proof. In recent years, the Amauti tends to be made with modern fabrics like polar fleece with cotton cloth or waterproof outer layers. Modern Amautis are growing in popularity generally and fetch high prices. 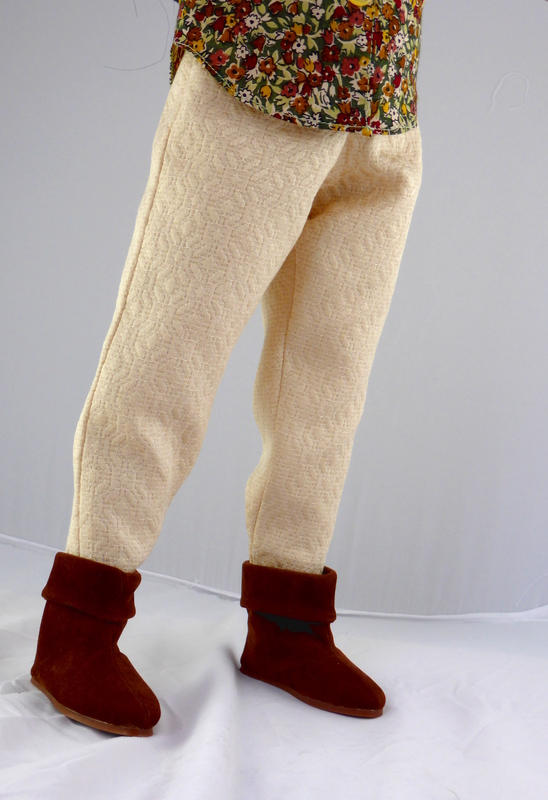 Saila’s Amauti is made using the Wren*Feathers Arctic Parka pattern by Jennie Bagrowski. The pattern has some of the strangest-shaped pattern pieces I have ever seen, particularly the front which has two large lobes of fabric which extend over the shoulders and join the back to form part of the pouch. Instructions are essential with this pattern and it would be pretty much impossible to work out how the pattern fits together without them. 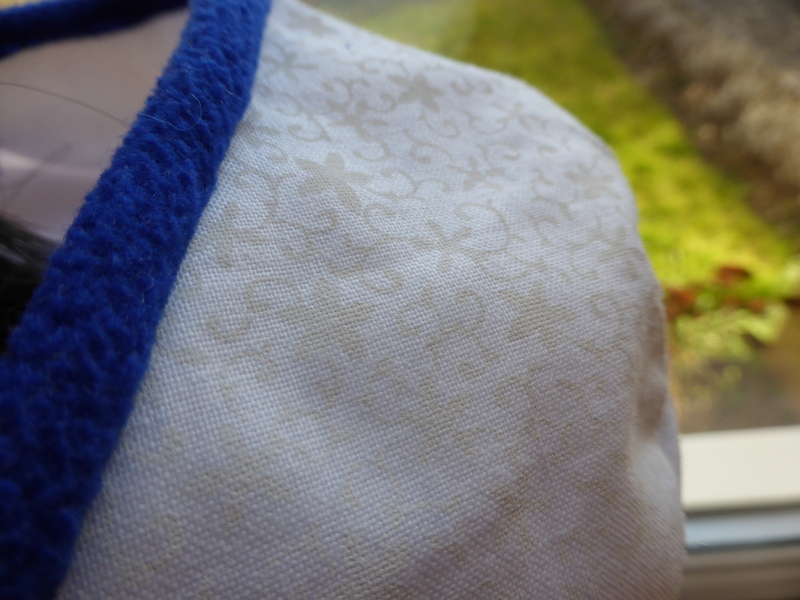 Tiny white flowers and swirls decorate the fabric. For the outer layer of the Amauti I chose a substantial white cotton fabric printed with white flowers and tendrils which reminded me of snowflakes whirling in a light breeze. The inner layer had to be a good warm fleece, and guided by the pattern instructions I chose microfleece in a royal blue. Saila is a Winter (how suitable!) so white and this clear cool blue suit her admirably. I decided against using fur fabric on the hood, as the winters in the south-west of England are so mild these days that it really isn’t necessary. 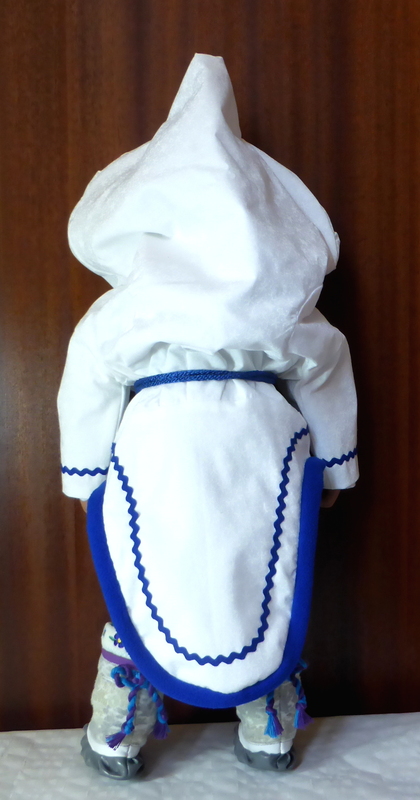 Rick-rack braid is often used to decorate Amautis so I chose a light one also in royal blue, and a matching silk cord to cinch in the garment at the waist. The hood is HUGE – room for two babies in there? I started with the outer layer as it was the easiest to work with. Following the pattern instructions closely I pinned and stitched the pieces together, all the while unsure exactly what I was doing and how this bizarre assortment of cloth was going to turn into a wearable garment. First the hood is constructed, then the sleeve tops are stitched to the strange lobes of the front. At this point I stitched the rick-rack braid onto the sleeve cuffs. The the back tail piece is stitched to the back, and then we get to the bit that Jennie warns us is tricky: we stitch the front to the hood and back, going around the lobes and finishing at the side seams. That I did find difficult, as I had a little too much fabric on the back. If making this again I would ease-stitch around the low hood back to help it fit the hood front. Then I turned my attention to the lining which was a fleece knit. I have learned to be cautious about knits as my machine will skip stitches if it possibly can. So I used a ball-point needle size 80 and set the stitch length to 3.5. These seemed to be the right settings and I had no problem with skipped stitches at all as I put the lining together. Because of its stretchiness it was much more obliging about fitting together, and as I had already done all this once I made good progress. Before putting the two layers together I had to stitch the rick-rack decoration around the hemline of the garment. I set it so that the top edge of the braid was 1⅜” from the edge of the fabric. It had to be pinned on carefully all the way around and stitching a straight line on that wavy braid was very difficult – it felt as if I was zig-zagging too! Now it was time to slip the lining inside the outer layer and join them together around the hem and hood with strips of fleece, in the same way as bias binding. My intention was to stitch the binding right-sides together and then fold the binding over to the wrong side and stitch in the ditch to catch it down invisibly. Unfortunately the pattern does not advise how wide to cut the fleece binding and I cut the hood binding too narrow at 1″ and had to do some hand-sewing to catch it down in places. So for the hem binding I used a strip 2″ wide, did all the stitching and then trimmed off the excess as needed. Last of all I slip-stitched the lining to the sleeve cuffs and then this complex garment was complete! All in all it took me three full afternoons to make. 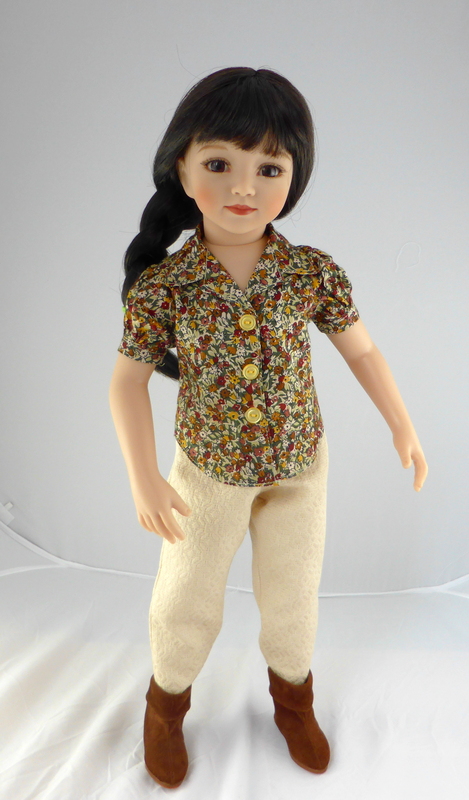 Saila wears her Amauti over her Maplelea jeans and a Kit’s Couture T-shirt. 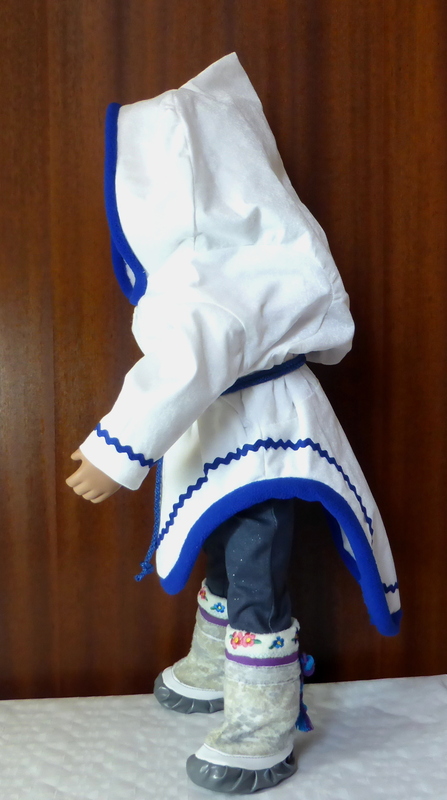 Her outer layer is completed by her kamiik (Inuit-style boots which were part of her ‘meet’ outfit) and her Pang hat, which was actually made for Maplelea by Inuit women in Pangnirtung. 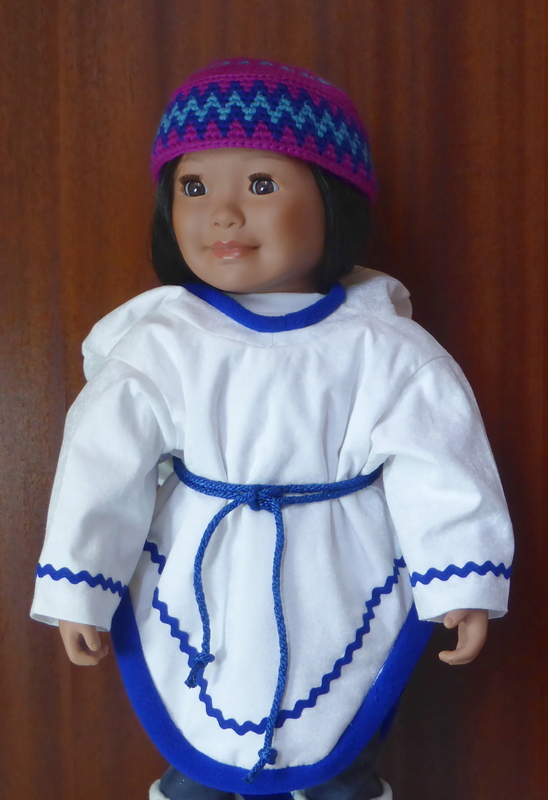 As you can see, she is very happy in her new Amauti, and very pleased that her first modelling assignment for Kit’s Couture showcases this striking piece of Arctic chic. Amauti? Check. Kamiik? Check. Pang hat? Check. Now where’s the snow? After all this effort to make an authentic Amauti, I learned that only women with children would wear one. A young girl like Saila, or a childless woman, would wear an Amautit – that second ‘t’ makes all the difference – which has no pouch. For anyone who is interested, there is more about the Amauti and its history and meaning for the Inuit people in this report from 2001. Maru’s first outfit from the Wren*Feathers patterns. Back in October, Jennie Bagrowski (jenwrenne) of the excellent Wren*Feathers blog, produced a wonderful collection of patterns for Maru and Friends. Patterns for Maru are rare as hen’s teeth so I invested in the lot immediately! I decided to make a simple version of the Versatility Pants, along with a tailored shirt with puffed sleeves and a curved hem, which I thought would look lovely in Tana lawn. In my wardrobe I had a skirt which I had to accept I would never again be slim enough to wear… The material was a luscious creamy light-gold brocade which would suit Maru perfectly, so I unpicked the skirt and used part of it to make some elegant trousers. Luxurious brocade – upcycled from a human-sized skirt! I have a tendency to sew slightly wider seams than patterns allow, so I cut a tiny bit more ease into the trousers just to make sure they would fit. However this really wasn’t necessary and if I were making them again I would follow the pattern size exactly. There’s not a lot to add, really, as the trousers made up easily and as I’d chosen the simplest variant, without pockets, they took no time at all. With its collar, revers, puff sleeves and curved hem, plus a fair amount of top-stitching, the shirt was much more complex. I made this up in the same Liberty Tana lawn as I’d used for the Hearts 4 Hearts dress during the Summer Sew-Along. Jennie’s patterns are accurate and come with very clear instructions. 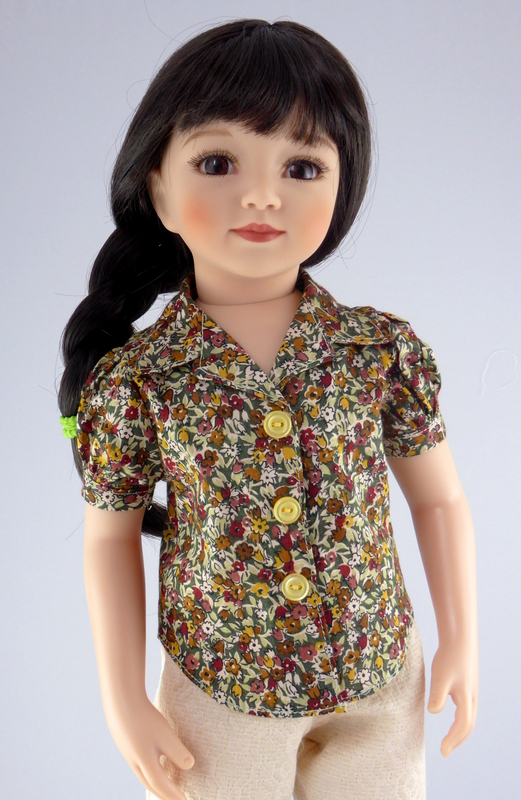 With over 18 months’ experience of sewing for dolls behind me, I was happy to find I had very few problems making up this sweet little shirt. The curved hemline was probably the most challenging part, but with care it came together as it should. I have to admit that I did intend originally to make proper buttonholes, but fearful of spoiling the lovely material, I ended up fastening the shirt with poppers. The two slight problems I did encounter were caused entirely by me not being absolutely exact with my seam allowances. Because of this, I had to ease the side seams of blouse and sleeves slightly to get them to fit together; and when Maru tried on the blouse we found that one of the cuffs was too tight to fit around her arm. Next time I make this style I will cut the cuff ¼” longer to allow for my over-generous seaming! Maru is delighted with her new outfit. The shirt is soft and comfortable to wear, and the trousers look great tucked into the tops of her suede ankle-boots. I very much enjoyed making these garments for Maru, and am really looking forward to trying some of the other patterns in the Wren*Feathers Maru Collection.